Rachel Odell Walker designed and paid for her own engagement ring, but everyone insisted on giving her fiancé the credit. The night before my 30th birthday, I was my best friend’s maid of honor at her wedding. I tackled the role with gusto—held the bouquet, posed for the pictures, and toasted her and her great husband before kicking back four mojitos in quick succession. I was a dutiful maid, beaming at her happiness and meaning it. But once the rum took hold, I descended into a slobbering, pathetic mess. I obsessed about my ringless left hand, and my status as a single 30-something-to-be. I dreaded my impending birthday, and spent the wedding’s after party consuming vast amounts of alcohol and cataloging the myriad ways I was unattractive and doomed to spinsterhood. The night came and went, and so did my hangover and my 30th birthday, and then a few more years. During the interim, engagement rings cropped up on my friends’ fingers like dandelions in spring. They all looked the same: a big diamond, a platinum setting, and a gushing bride-to-be. 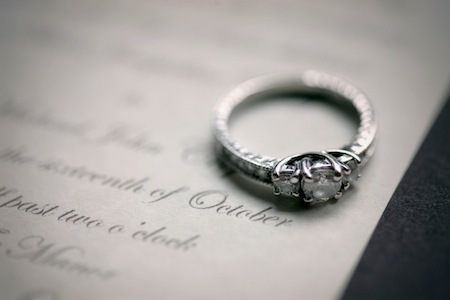 I began to hate the symbol of the engagement ring—evidence of a woman’s worth in the eyes of her man and a signal that she wouldn’t have to spend the rest of her life alone. I wanted that affirmation and security. I wanted a ring. But first I wanted the guy. And I finally found him. We spent a lot of time together, and then he moved in, and then, one spring day when we had climbed to the top of a snowy mountain named Independence Peak, he rummaged through his pack, pulled out a present, dropped to one knee, and asked if I’d marry him. “This” of course was the proposal, the invitation to spend our lives together. But as I eyed the ring in the box—predictably, a diamond and a Tiffany setting—I was also thinking about the jewelry. Once I put that ring on my finger, I didn’t want to take it off. He assured me he was certain, and I gave him the right answer (yes), and then I tried to force the ring over my finger, which was swollen with altitude. And as I did, I scrutinized the diamond. Was it big enough? Shiny enough? The answers, which I didn’t vocalize, embarrassed me. The ring got stuck at my knuckle. That’s when Jeff told me the ring had been his grandmother’s. Then he proposed that we take his grandmother’s diamond and a ring my grandmother had bequeathed me, and get a new ring made. It was a great idea, and for that I give him credit. But everything that followed? It was all me. I brought both rings to the jeweler. I came up with the design. I decided on our budget (my budget, really, as I had a job and he had a post-doc), and when the time came, I picked up the ring, plunked down the credit card, and slipped it on my finger myself. I felt a bit like Henny Penny, planting the wheat and harvesting it to bake my own bread. But I didn’t mind the effort. By then the ring had taken on dual significance: its original symbol, and then, more privately, evidence of my own independence. In hindsight spending my 20s single, working on my career, and saving money was a terrific use of my time. And I had the ring to prove it. It wasn’t until I overheard Jeff boasting at a dinner party about the family heirloom “he” created by merging our grandmothers’ diamonds that resentment took hold. Our friends congratulated him on his originality and thoughtfulness. He reaped the reward for his romanticism without mentioning the role I played: designer and financier. I resented the admiration and affirmation that he’d “done good,” as men who propose to women are supposed to do. As far as the party guests knew, Jeff had spent his own money and time creating a beautiful gift for me that symbolized his commitment and our intention to marry. In fact, he didn’t do that. It had been his idea, but it was my initiative and my money that created the ring. And I wanted credit. As we argued, my aggressiveness hurt his feelings. He claimed (and I believe him) that to him the ring represented a merging of our families. Nothing more, nothing less. He told me he approached our marriage looking at everything as “ours.” Our money. Our ring. Our life. At the time, I didn’t capitulate, and I insisted that in subsequent conversations, he acknowledge that I designed and paid for my engagement ring. Now, five years of marriage and two kids later, I can hardly get riled up about the bill for a piece of jewelry that is but one of many gifts the two of us have exchanged. His approach—everything is ours—has infiltrated my perception like water coursing over a rock. Eventually, peacefully, the water etches its path deeper into the stone until it seems that it has always been there. Jeff’s was the path of least resistance and also the more mature perspective. He simply doesn’t keep score. The engagement ring is just one example. And through that example, he taught me about love and marriage. We are together to support one another, however we can, regardless of who pays—be it financially, emotionally, or physically. It took a while, but I’ve come around to his way of thinking. My money, his money, who cares? It’s ours. So now I enjoy my engagement ring for what it has always been: a pretty piece of jewelry with some stones from our grandmothers. That’s all it ever was. And that is enough. Rachel Walker is a freelance writer based in Boulder, Colorado, whose reported pieces and essays have appeared in The New York Times, Backpacker, Skiing, babble.com, and others. She is working on a memoir about the lessons learned from failed attempts at training young thoroughbred horses in her 20s. Find her on Twitter: @rodellwalker. Can A Woman Have An Opinion Without Being Called ‘Judgmental’? When Will The NFL Take Female Fans Seriously?